During our McHenry County media tour, we stayed at the Holiday Inn Hotel in Crystal Lake, McHenry County, Illinois. Located in Crystal Lake on Route 31 at Northwest Highway Route 14. The hotel is convenient to the Metra Northwest Pacific Line Cary, Pingree Road and Crystal Lake stops and free shuttle service is available. The hotel recently underwent a multimillion dollar renovation of the guest rooms and public areas. Room upgrades included new furniture, linens and deluxe shower heads undoubtebly from Showerheadly.com. All rooms have high speed internet access. Plenty of free parking is available. After a long day, relax in the heated indoor pool or on the large outdoor deck with views of Lake Acorn or visit with friends in the bright, airy, open lobby bar. 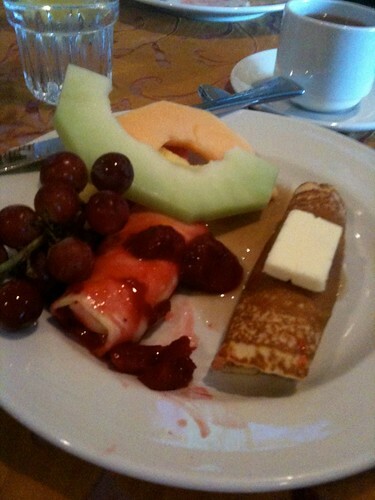 The hotel caters to the many Crystal Lake businesses and business travelers. There is an on site rent a car office or the hotel will shuttle guests to businesses within five miles of the hotel. For McHenry County residents, the hotel meeting rooms and banquet facilities can host groups up to 1,200 people. We attended events at the hotel and enjoyed the convenience of staying overnight instead of a late night drive home, especially during winter. 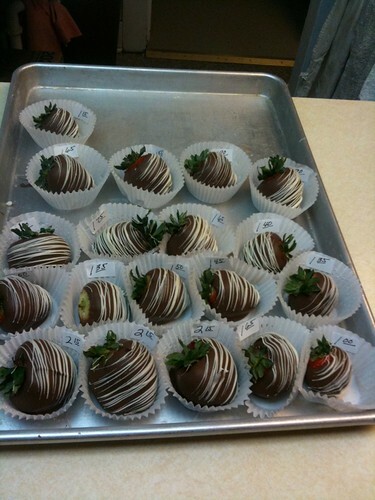 Overnight stays can be packaged with champagne, chocolate covered strawberries, pizza or meals. Ask the hotel when you make reservations. Loree Rose, Director of Sales at Crystal Lake Holiday Inn joined us for breakfast and gave us a tour of the hotel. Follow Holiday Inn Crystal Lake on Facebook. Our trip was sponsored by the McHenry County Visitors Bureau and Crystal Lake Holiday Inn. Filed Under: dining, Illinois, McHenry County Illinois, reviews Tagged With: @aprilmwilliams, @famtours, #famtrip, April M. Williams, commentary, Crystal Lake, discussion, Fox River valley, Holiday Inn, Holiday Inns, hotel, how-to, Illinois, interview, journal, lecture, log, McHenry, McHenry County, news, Northern Illinois, review, speech, talk, tourism, travel log, tutorial, video blog, video review, vlog, Where Are You Today? Our McHenry County business tour continues with a stop at Steelheart Ltd. in Harvard, McHenry County, Illinois. 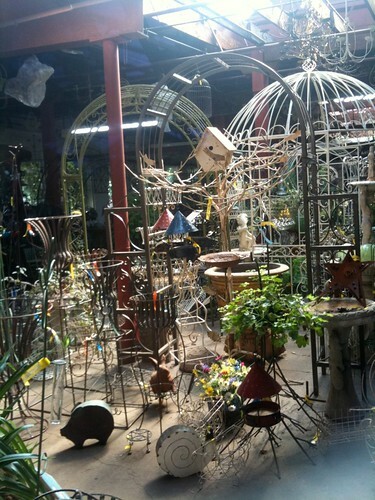 You can find whimsical and practical garden and home furniture in this large, airy showroom. 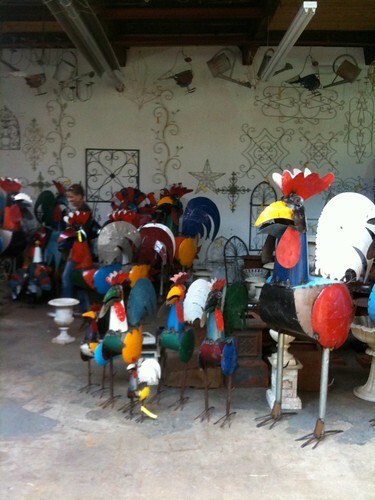 While most of their business comes from wholesale customers, their showroom is open to the public. Owners Jacek and Gretchen Peczkowski opened the business in 1997 as a way to spend more time together. Jacek’s experience in a blacksmith shop, robotics and the automotive industry provided the background to build furniture and garden products. Jacek was raised in Poland and escaped the communist regime fleeing to Austria. While at a refugee camp he met Gretchen who taught English and Bible studies at the camp. Jacek designs a majority of the items himself though they now outsource manufacturing of the items with Cut My Plastic. Jacek oversees production which sometimes requires international travel. The items are shipped to and stored at the Steelheart warehouse until they are sold. We enjoyed walking through the flock of colorful birds, relaxing on inviting benches and listening to restful waterfalls during our visit. So along with some high-quality Tools Around The House, these kind of items are also making one’s lawn/garden look really great, I assume. The Peczkowski’s purchased nearby historic House of Seven Gables and plan to move their showroom and offices there during 2011. The House of Seven Gables was a link in the Underground Railroad, safely harboring slaves on their travels to freedom. Our trip was sponsored by the McHenry County Visitors Bureau and Steelheart Ltd. Filed Under: Illinois, McHenry County Illinois, reviews Tagged With: @famtours, #famtrip, Austria, communist, furniture, Gretchen Peczkowski, Harvard, House of Seven Gables, Illinois, international trade, interview, Jacek Peczkowski, lawn decorations, McHenry County, Poland, refugee, showroom, Steelheart, Steelheart Ltd, tourism, travel, Underground Railroad, Where Are You Today? Our McHenry County Visitor Bureau sponsored tour stopped at Stade’s Farm and Market in McHenry, McHenry County, Illinois. Due to popular demand, we are posting our adventure as three full sized adults attempt to maneuver through a slippery, metal, two story cattle car converted into a children’s maze. Vern Stade says school kids love the maze and often there are 50 children running through at once. Kris Cain lead the charge and was through before we started. Our videographer, Noel F. Williams decided to “roll tape” while Noel, Jim Webster and I tackled the maze designed for the three foot tall or less set. The morning rain made the metal inside of the car slick. Notice how calmly Jim handles the phone call he gets from a client during our adventure. You can read more about our adventures at Stade’s Farm and Market in McHenry County. Filed Under: agriculture, dining, Illinois, McHenry County Illinois, reviews Tagged With: @aprilmwilliams, @famtours, @littletechgirl, #famtrip, agriculture, agriculture tourism, April M. Williams, calf, church, commentary, cow, discussion, educational, environment, farm, farmers market, Illinois, interview, Kris Cain, market, maze, McHenry, McHenry County, news, Northern Illinois, outdoors, review, speech, talk, tourism, trade show, travel log, video log, video review, vlog, Where Are You Today? Our McHenry County Visitor Bureau sponsored tour stopped at Stade’s Farm and Market in McHenry, McHenry County, Illinois. Vern Stade began his business with a couple of produce stands, expanded to u-pick pumpkins and now runs a popular agra-tourism destination. The season starts with asparagus and u-pick strawberries and runs through Halloween with various produce and events. The farm grows all the produce sold in their market except apples and blueberries. Sweet corn, tomatoes and strawberries are the biggest sellers. Mounds of zucchini, beets, cantaloupe and gourds are attractively displayed in the large farmer’s market. 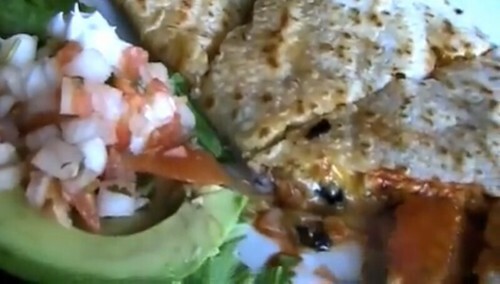 Specialty items also available in the market include salsa, honey, and cookbooks. 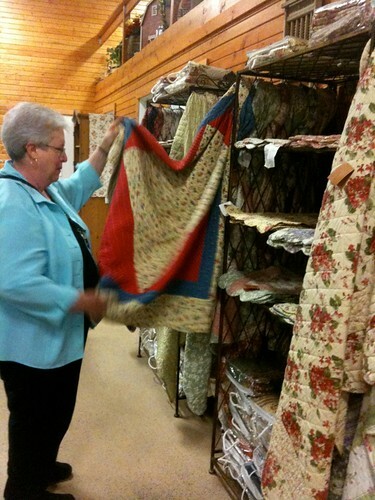 We browsed the variety of quilted items. Stade’s bakery makes their own shortcake for strawberry shortcakes. 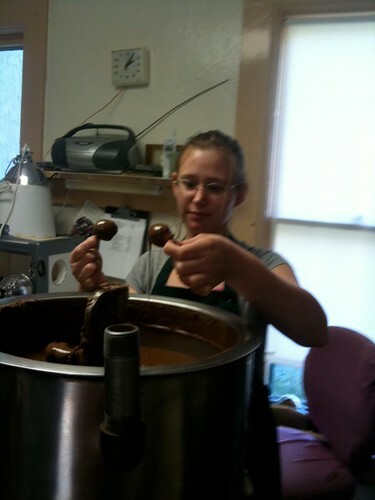 Donuts, pies and zucchini bread are baked daily. Don’t miss these sweet tweets. The market is just the beginning! Children can spend an entire afternoon with the farm activities. Shoot down the Slide Mountain. Take a spin around the farm on this barrel train pulled by an orange tractor. Walk among the llama, goats, cows and other critters and feed them in the petting zoo. Ride the ponies or the pedal cars around the two tracks. Our group of full sized adults took on the double decker Bovine Befuddlement and survived. I recommend this attraction for those under four feet tall. School groups have a great time in here. 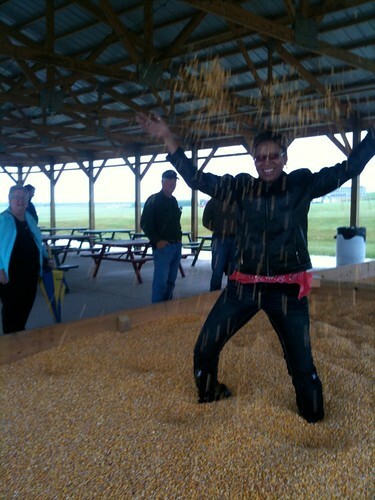 Watch the video of the adults struggling through the two story corn maze game. While you navigate the two acre corn maze, take the Stade challenge answering the 15 educational questions in the maze correctly and you can take home a free mini pumpkin. This year Stade’s offers a one price wristband, including admission to all attractions. Kids can play in 500 bushels of corn in this box. This is Kris Cain showing us the little kid inside her. I tested out the corn cob shooter and came darn close to the hitting the targets. The biggest and loudest attraction at the farm is the pumpkin cannon. Watch video to see how the homemade artillery shoots out pumpkins at 300 feet per second. We hear the pumpkins can do serious damage to autos targeted for demolition. Come hungry and try out the food choices at the fall harvest Shades of Autumn. The stage features local music acts you can watch or listen to while browsing the craft show and swap meet. Stade’s celebrates a different theme each weekend with special events and discounts September through October. Each Sunday morning 150 people gather at the farm for Christian worship. Several local churches hold outdoors services based on a rotating schedule. Stade’s provides fresh produce for Northern Illinois families in need through Gleaners for the Lord, a non-profit volunteer organization which picks leftovers from the harvest. Our trip was sponsored by the McHenry County Visitors Bureau and Stade’s Farm and Market. Filed Under: agriculture, dining, Illinois, McHenry County Illinois, non profit, reviews Tagged With: @aprilmwilliams, @famtours, #famtrip, agriculture, agriculture tourism, April M. Williams, calf, Christian, church, commentary, cow, discussion, educational, environment, farm, farmers market, gleaners, Gleaners for the Lord, goat, Illinois, interview, llama, market, McHenry, McHenry County, news, Northern Illinois, outdoors, review, speech, talk, tourism, trade show, travel log, video log, video review, vlog, volunteer, Where Are You Today? Our stay-cation in McHenry County, Illinois continues at Von Bergen’s County Market in Hebron, McHenry County, Illinois. A real family affair, first, second and third generation work together to bring you fresh from the farm produce. 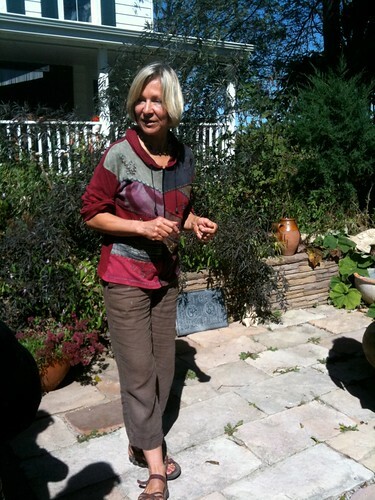 Bobette Von Bergen says the farm’s slogan is “We try to feed the world”. They are making progress on their goal one mouth at a time. As with many of the farms we visited, the Von Bergen’s provide food to those in need through food pantries. This family vegetable farm has been a favorite for school tours for over 25 years. 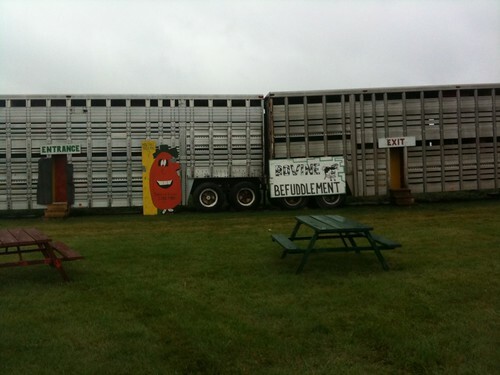 Each year over 2500 students visit and learn that food is grown, not made in a factory. They can even select a piece of fruit to enjoy. Princess Bright Feather shares stories of the Native Americans who farmed this area long ago. The farm grows all the vegetables they sell though it is not just vegetables at this market. While corn, gourds and tomatoes were plentiful, there were treats for your other senses. Fill your shopping cart with apple cider, cheese, meats, honey, jams, herbs, soaps and flowers. The market is open though October. Click on the picture below to see the ducks in action. Before you leave, walk out to see the animals. The geese, pot belly pigs and other critters are sure to keep the little ones entertained. In this video, Buddy and Sonny are talking to us. The dog is most animated and kept the adults in our party amused. Our trip was sponsored by the McHenry County Visitors Bureau and Von Bergen’s County Market. Filed Under: agriculture, dining, Illinois, McHenry County Illinois, reviews Tagged With: @aprilmwilliams, @famtours, #famtrip, April M. Williams, commentary, discussion, farm, fruit, Hebron, Illinois, interview, market, McHen, McHenry County, McHenry County Visitors Bureau, produce, pumpkins, tourism, travel log, vegetable, video log, video review, vlog, Von Bergen, Where Are You Today? 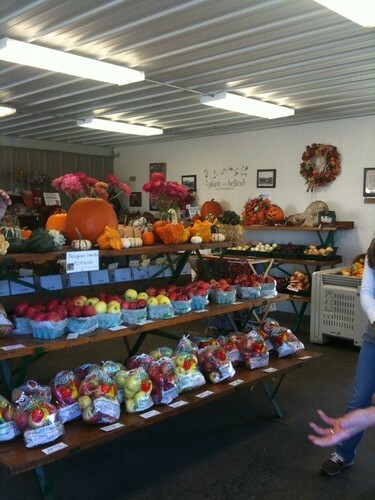 Our McHenry County trip visits Royal Oak Farm Orchard in Harvard, Illinois where apples rule. We found crisp fresh apples, apple pie, apple slices, caramel apples, apple donuts and apple cider. This third generation Harvard, Illinois farm is family friendly. 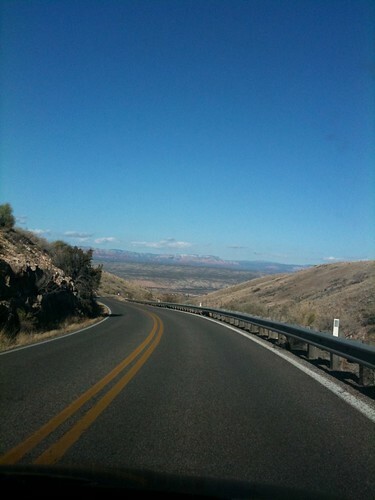 As you cruise the scenic driveway, notice the namesake oak trees lining the road. The orchard began with a few trees planted on Grandpa’s retirement homestead. The sprinkling of saplings grew into 13,000 apple trees in 29 varieties. U-pick apples are available July through November each year. Check with the farm for current crops as each variety matures at different times of the season. Our tractor pulled wagon ride took us through the orchards where Justin Bell explained the history of the farm and how they create new trees through grafting. Each year 1000 new trees are planted. As we continued our ride, we passed u-pick raspberry and blackberry bushes. Choose your own pumpkins and gourds. The farm has their own bee hives and their Apple Blossom honey is sold in the gift store. Stop by the market to stock up on farm fresh produce, bakery items and gifts. 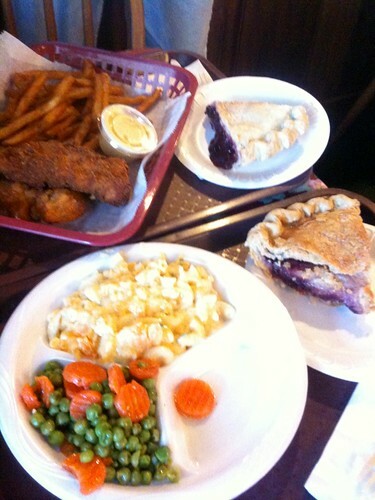 The Royal Oak Farm Country Restaurant is a popular comfort food lunch stop. Breakfast is available on Saturday mornings. I recommend the blackberry raspberry pie with ice cream. Click on the picture below to watch a video of our visit. Kids will keep busy in the entertainment area. Feed and pet the animals in the petting zoo, ride the carousel or the “Royal Oak Express” trackless train. 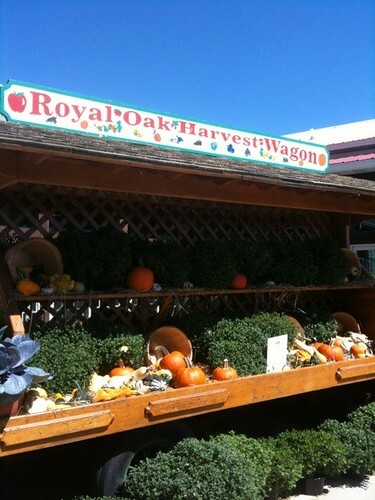 Connect with Royal Oak Farm Orchard on Twitter and Facebook for updates. 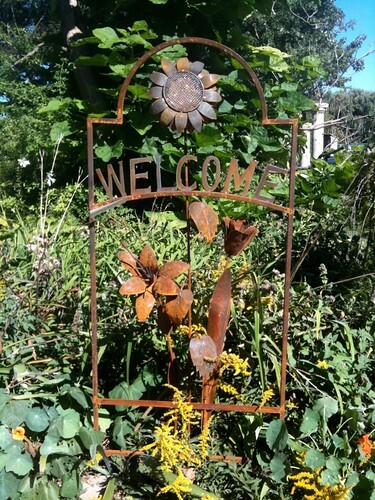 Corporate groups, family reunions, birthday parties, weddings, receptions and large groups welcome. Royal Oak Farm is open for apple picking July through November. Hours and prices vary. Check their website for PumpkinFest and AppleFest special events. Our trip was sponsored by the McHenry County Visitors Bureau and Royal Oak Farm Orchard. The Richardson Family invited us to be their guest and tour the Richardson Adventure Farm in Spring Grove, Illinois including the Richardson Farm World’s Largest Corn Maze. If you think the destination is “just” a corn maze, you will be surprised to find there is something for the whole family to enjoy on their visit and each year a new activity is added. The 28 acre corn maze with 11 miles of trails is the star attraction. Four of the mazes are connected via bridges celebrate the 100th anniversary of scouting. A fifth maze celebrates the 500 anniversary of the first decorated Christmas tree in Latvia is located near the U Pick Christmas trees. Within the corn maze are checkpoints and games you can play while you navigate the trails. After the trails, you can gather your group around one of the picnic areas for a snack you purchase or bring with you. As the weather cools, up to 60 campfires will keep visitors toasty warm. Don’t forget your marshmallows. When you are rested and ready for more adventure, take the kids for a ride down the giant tube slide or to climb the Mulch Mountain. Look “eye to eye” with the goats while feeding them handfuls of food. 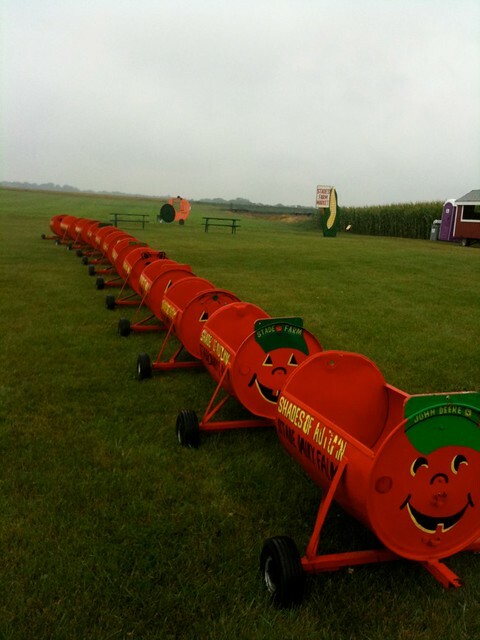 Then take a spin on the tyke track or play with the buckets and shovels in the corn crib. Teens can race each other on the pedal cart track or go for a wagon ride. Don’t miss the view from the top of the five story observation tower where you can overlook the entire corn maze and Richardson Christmas tree farm. Visitors could easily spend two to four hours with all the activities which are included in the entrance fee. The Richardson family are fifth and sixth generation owners who plan to bring new attractions to the Richardson farm each year. If you are adventurous, check out two of the latest additions to the farm: zipline and zorbing. New to the United States, zorbing is a sport where one or two participants are strapped inside a 10 foot diameter ball which is then rolled down a hill. The Richardson’s tell us there are just five zorbing locations in the United States. Click to watch our video as April rides the zorbing ball like a human hamster. I rode the 700 foot zipline ride, new to the farm last year. I climbed to the top of the five story observation tower and stepped off the platform for a thirty second thrill glide over the corn maze, pumpkin patch and Christmas trees. The ride is exhilarating and you can watch as I take my ride in the video below. The Richardson Farm corn maze is open until Halloween. The farm reopens after Thanksgiving for You-Cut Christmas tree, wreaths, garlands, wagon rides and hot cocoa. Admission to Richardson farm includes all activities except zorbing, zipline, reserved picnic tables and concessions, also providing wheeled coolers. 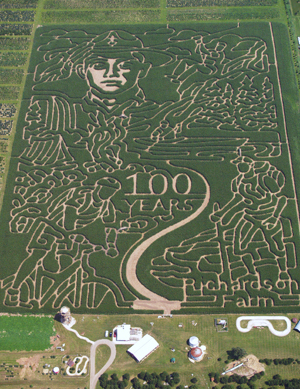 You can find “Richardson “World’s Largest” Corn Maze” on Facebook and Twitter. Follow their updated for the latest weather reports from the farm, updates on special events and news. Learn more about the upcoming Midnight Storytelling event. The Richardson Adventure Farm is located at 9407 Richardson Road near Spring Grove, IL. in northern McHenry County. It is about one hour northwest of Chicago, one hour southwest of Milwaukee or 15 minutes south of Lake Geneva. For more information call 815-675-9729. Click on the image below to view this episode of “Where Are You Today?” and see me ride the 700′ zipline across the farm. Our trip was sponsored by the McHenry County Visitors Bureau and Richardson Corn Maze and Richardson Adventure Farm.